We are highly specialized in Scalp Pigmentation, Micro Needling and Acne Removal. When it comes to Botox® Cosmetic, millions of men and women around the world have discovered that freedom of expression is what it’s all about! Botox® has a long history of success, with more than 20 years of effective treatments. Botox® is approved for medical use in Canada and 75 other countries around the world, with 20 different medical applications. 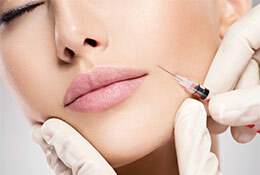 Botox® Cosmetic is a purified protein that we inject to target dynamic wrinkles. These wrinkles are caused by repeated muscular contractions over the years, like frowning and squinting. We can help refresh your look with a quick and easy treatment that can be done over a lunch break. This simple treatment is so effective at rejuvenating and refreshing your look in typical cases that Botox® Cosmetic has become North America’s most popular physician-administered cosmetic treatment! Our treatment can be used to help visibly smooth frown lines (lines between the eyebrows), crow’s feet, and horizontal lines that run across the forehead. It can enhance your look without changing your features or limiting your expressive abilities. The typical results are natural looking and can give you a refreshed and reinvigorated appearance. We also offer Botox® Cosmetic treatment for hyperhidrosis to confront the discomfort of excessive sweating. 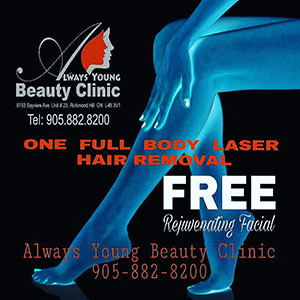 At Always Young Beauty clinic we have highly-trained practitioners specializing in non-surgical cosmetic treatments. We are committed to providing you with the best aesthetic services needed for a healthy and beautiful image of you. We at Always Young Beauty clinic provide a full range of non-surgical cosmetic services, including: Laser Treatments, Skin Care, Permanent Make up and Pigmentation. Our health-care team consists of experienced practitioners who are dedicated to your health and beauty. Copyright © 2016 Always Young Beauty Clinic. All rights reserved.